How Side-Scan Warehouse Labels Help Reduce Errors and Improve Inventory Management | ID Label Inc. Step into any modern warehouse and you’ll see barcode labels just about everywhere. Why? They are crucial for successful inventory management and an efficient picking process. Implementing the right label for your needs and technology environment is key. There are several options to consider. In a recent post we looked at the advantages of using vertical location labels for some multilevel warehouse rack environments. In today’s post we take a look at an exceptional label option manufactured by ID Label: SideScan 45TM. SideScan 45™ angled labels provide for more accurate scans, which boosts worker productivity and minimizes the need for manual data entry with its inherent potential for errors. 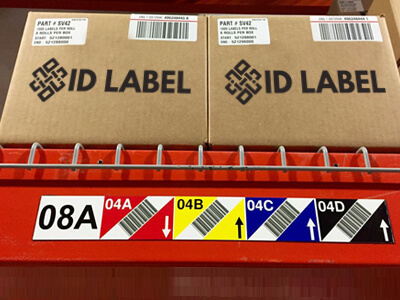 ID Label’s SideScan 45™ labels are an ideal option for person-down rack environments. Multiple barcodes can be printed on a single horizontal or vertical label installed at eye level to identify numerous bays above. This eliminates the need for long-range scanning equipment and minimizes errors and potential confusion about which rack to scan. SideScan 45™ is a linear barcode label intended for multilevel warehouse rack systems. It takes its name from its design: the barcode is angled at 45 degrees. 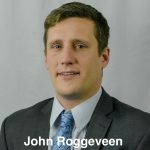 “Angled location labels have been proven to provide greater accuracy, improving picking and the overall inventory management process,” Roggeveen said. More accurate scans – Due to its unique layout and surrounding white space, side-scan labels are less susceptible to human error. Scans are more precise with fewer mistakes. Improved inventory location accuracy – Accurate scans mean inventory can be properly identified and located in bays. Fewer picking errors – When inventory is properly located, it means the correct pallets can be found the first time with fewer picking errors. More efficient overall operations – Ultimately, side-scan labels help to drive operational efficiencies and speed-to-market by ensuring warehouse workers locate and pick inventory accurately and reliably. ID Label’s SideScan 45 labels are an ideal option for man-down rack environments. Multiple barcodes can be printed on a single horizontal or vertical label installed at eye level to identify numerous bays above. This eliminates the need for long-range scanning equipment and minimizes errors and potential confusion about which rack to scan. Parallel design, where all the barcodes are angled in the same direction. This option takes up less beam space and facilitates quick, accurate scans. Saw-tooth design, where the barcodes alternate angles like an upside-down “V.” This option further reduces possible scan errors due to its unique design and scanning interface. Industry best practices recommend that SideScan 45 labels be accompanied by rack location companion labels. These human-readable labels are used on rack levels at each bay location. They are color coded per level to correspond with the master SideScan 45 label to help ensure accuracy and minimize errors, especially for conducting regular inventory and cycle counts. SideScan 45 labels are fully customizable. They are typically manufactured with specialized laminated polyester facesheets and strong adhesives for maximum durability and reliability. They can also be manufactured with ID Label’s award-winning Clean Release™ adhesive or with a magnet backing for location flexibility. “Our quality-manufactured preprinted labels are far more durable, long-lasting and cost-effective than typical labels produced by warehouse staff with in-house printers,” Roggeveen said.